Margin, a term familiar from tender age; notebooks with clear cut margins to delineate the main body of text, define it. The margins give it definite shape, a practice that continues into the virtual world. Among humans, it is these margins that give identity to the large majority we term normal. The often, porous boundaries offer a chance for individuals to slip through and slip back into either ‘normal’ or ‘marginal’ spaces. The decision to identify with marginal groups or positions can be a conscious one as with (gender identity, drug use), enforced as in (mental health, racial and caste based discrimination) and accidental for (drug use, stigmatized diseases). In certain instances, as with mental health, some individuals may find their being part of marginal groups a permanent reality, in most other instances individuals do move in and out of marginal groups, as a survival strategy to deal with marginalization. Even when physical spaces merge, with an emphasis on and the assertion of legal rights for the marginalized, mental spaces for discrimination continue to exist. The process of marginalization has been explored in different contexts by social scientists. This article reflects on ‘Being there’ (Dasein) in marginal groups, how temporal, everyday experiences create discord and explores how our emphasis on rigidity in social norms strengthens marginalization, focuses on what we offer to individuals in marginal groups, how marginal groups deal with ‘being there’. The role of self-knowledge, its development; and the probable role of self-knowledge and schema in bringing change in the self-perception of individuals living in the margins and in the perception of others. The concepts explored include: Being-there (Dasein), Being with Others, Being with One’s Self, Being in State of Anxiety, Fear or Addiction (Heidegger, Martin (1962) (2) , synthetic judgement, synthesis towards knowledge creation (Kant 1991)(3), self-knowledge and its relevance in the lives of individuals who live in the margins; for their deviation in sexual identity, drug use or mental health concerns. Our interaction with those in the margins often highlight our selective perception and our capacity to deny, ignore and condone acts or norms strengthening the walls of separation between us and others; who we perceive and label as different.Why do we refuse to acknowledge those who live in the margins and their right to be, is it because of our lack of perception of a reason to be different or is it because of a perceived or misconceived utilitarian value that stands paramount over all else or is it because of an absence of causality or associational factors that make it possible to perceive, feel, experience and define the differences? There are instances where we have been open in our search for knowledge, founded on slippery assumptions; given freedom and acceptance for search to strengthen the body of knowledge; even when the validity of that knowledge increased the disconnect from the assumptions on which that very knowledge was founded. An argument in line with Kant’s thought about our limitations in understanding truth, while talking about Metaphysics. Aren’t these observations valid in the case of scientific knowledge as well. Take the case of medicine, to study a specialized field of care for ailments related to any organ within our body, we do consider the rest of the human body as given, static and universal (by and large), except as variations for age, pregnancy, and at times ethnic reality. Can this be valid, given the complexity of our human body. We select what we can deal with, assume the rest to be irrelevant and then move forward as though our assumption be universal truth. The recent classification of mesentery (4) as a new organ and the possibility of it influencing the care of ailments does bring to light the possibility of many aspects of our body not being fully understood. There may be many permutations and combinations that we have ignored about healthcare for mind and body. For that matter take tonsils, an organ removed at the drop of the hat around three to four decades ago is now associated with valid functions in human immune defense mechanisms. The treatment for tonsillitis is no longer single line -surgery(5). When our objective scientific knowledge is based on assumptions, can’t we at least explore our refusal to acknowledge our margins beyond considering that as space for the ‘Different’. Being is a self-evident concept that is indefinable (Heidegger,1962.23p), he explored the different characteristics of ‘Being’ and set these out as: Being in the world, Being-present-at-hand, or Being-ready-to-hand (for). All part of our reality which we rarely give a second thought to. For example, as indicated by Heidegger, Being-in-the-world, where ‘in’ means the relationship of ‘Being’ which two entities, extended in space, have with each other within that location in that space. As in the case of a bench in a lecture room, that can be extended further to be the bench in a university, to the bench in a city, further to the bench as part of world-space (ibid.79p.). Our existence and how we relate to others or entities within our environment or world-space is influenced by identities that we have accepted to define ourselves with. Often identities are focused upon as a reality of a community or group; where the assertion may be for the acceptance of group identity (Heyes Cressida, 2010) (6) ; it could mean acceptance of a demeaning, stigmatizing frame of reference provided by the dominant group or culture that results in discord and conflict between groups. But, isn’t there discord at the individual level even before a discord is reached at the group or community level. This discord can be result of Being at a personal level, especially that which Heidegger termed as ‘Dasein’ or ‘Being there’ as ‘I’. When Dasein connects itself to different events or entities it can existentially choose to be itself or not, “Dasein has either chosen these possibilities itself, or got itself into them or grown up in them already” (Heidegger, 1962. Pg. 33). Other philosophers have focused on Dasein, this has been looked at by Wheeler (2011)(7); Mulhall (2005) said it offers our consciousness, at every moment in our life, to ‘choose’ our way to be. It is probable one follows a set path without thinking about the choice made or the alternative possible. According to Sheehan (2001) Dasein cannot be but open, it is not an exercise of our will a necessary characteristic of an a priori structure of our existential constitution. As open, there would exist individual choice to arrive at different states of mind. Dasein in its ‘everydayness’ of encountering with entities or others may follow the set path of averageness whereby it is not Dasein of Self but Dasein as Being with others or Being-with-one-another that has an upper hand. Under such circumstances there is little room for discord and everything flows as per plan, but what happens when Dasein as “I” asserts itself over all else. The smooth flow of events in everyday reality can be disturbed not just by our assertion of the ‘I’, but also when we no longer are able to use the serviceability of an entity or equipment; or we are unable to relate in a manner in which we have associated with an entity in the past. Heidegger uses the example of the hammer to illustrate a discord or broken encounter as, when using the hammer, the structure of the hammer is not in our focus and nor is it grasped thematically. While a broken hammer, does bring the hammer back into focus, as an entity. The smooth flow of events can be disturbed, if we focus on the hammer, while learning the mechanical act of hammering. For, when we focus on the hammer as an entity, we increase the chances of our finger getting nicked. In that split second, unintentionally, one can disturb the flow of the event. For e.g. focusing on the hammer as an entity or equipment, affects the act of hammering. In a similar manner, when in the state of Being-with-others, If Dasein asserts as Self for a split second and encounters a Being or entity on an assertion of Self, at that moment everything viewed as Being-there or Being-present-at-hand or Being-with-one-another changes. It could be while encountering sexuality not in line with accepted norms, identifying the ‘I’ as gay, transgender, or bi-sexual. This moment may not be followed by action to assert the Dasein as ‘I’ and not-as-one-with-others; Dasein as ‘I’ may be same as Dasein with others, or share the same state of Dasein. Irrespective of whether a difference in sexuality, experienced at the level of thought, gets translated into action or not it exists for that moment in the ‘world-space’ of sexuality. Given this, another question arises not just about the diversity in sexuality but of the possibility that sexuality of Dasein as ‘I’ isn’t static. While action can be controlled as when Dasein as Being with-one-another or others takes over instead of Dasein as ‘I’; it does not change the experience (at the level of sense or thought) of Dasein as ‘I’. Can this, experience in the absence of action, be addressed by existing interventions or by law? Isn’t it possible such experiences of varied beings could exist in the world space of sexuality? In that case, would that planned attempt to ensure elimination of genetic deviation in sexuality to create a static human profile, be relevant. Unlike sexuality, with drug addiction the character of Being is that of ‘out-for-something’, here it is not addiction to an entity ‘present-at-hand’, but the entire structure of Being-there that is modified. According Heidegger (ibid, 240) in case of any addiction, Dasein becomes blind and puts all possibilities into the service of addiction. c) the use of drug as a part of Being-with-others, Being-with-another, or Being ready-to-hand (perceiving the drug to have the central, functional role as facilitator; be it for increased performance at work, for studies....), manipulating the temporal reality of Being. Increased involvement with the drug (entity/equipment) in different states of Being, could for an individual, make his/her journey to a general state of Dasein or Being-there, without the concerned drug, complex and difficult. For example, if the drug is believed or perceived to facilitate - work, social interaction, emotional relations, education; moving out of addiction can be difficult and complex. Mental health problems can reflect as difficulty in ‘Being- there’, or ‘Being-with-other or another’; as the specific characteristics of Dasein as ‘I’ can consume all else. The individual’s experience of temporality may complicate the state of Dasein experienced by the individual in ‘Being-with-other’ or ‘Being-there’. Besides, Dasein is not static, but stretches itself from birth to death, connecting Life as a sequence of experiences in time. Though, Dasein’s experiences are constantly changing, as experience is always ‘now’ or current view the Self maintains itself throughout with a certain selfsameness (Heidegger, 425p). For Dasein, whatever happens, it experiences it in time. When an individual is hallucinating or even experiencing an urge to repeat an act as a neurotic, or is in a psychotic stage of withdrawal, it changes Dasein’s experience of Being-there, especially as a temporal reality. When such connectedness in life is lost how does it affect the Dasein yet to be, in that stretch between birth and death. This loss of connectedness may vary depending on how far up it affects the different characteristics of Dasein, such as Being present-at-hand, Being-ready-to-hand, Being-with-other and Being-with-another. The impact on the individual varying depending on the age at which the tryst with mental health occurs. We cling not only to our identities as groups within larger society but also to our profile as humans. When there is a discord in these assertions, conflict results; we either evolve or create rigid barriers to ensure our profile remains static. Our desire for a static profile is reflected in our harsh cultural/legal sanctions against diversity, as in the case of sexual identities; being transsexual, gay or lesbian. It is this desire for a static profile for ourselves that creates walls of separation with those who assert deviation in sexual identities, who use drugs or have mental health problems. Our struggle with variation in sexual identity, reflects our desire to deny empirical evidence of diversity and attempts to portray a selective perception as a universal reality. To take an illustration in line with Kant’s view, ‘All members in tribe X are short’ does not mean there aren’t any individuals who are tall, nor does it mean in future there can’t be taller individuals; with empirical statements, it is difficult to arrive at a universal conclusion. In the case of gender, there is clear empirical evidence that human sexual identity cannot be limited to the male and female. Yet, we use cultural norms and laws to avoid the reality of diversity in sexual identity, that goes beyond traditional categorization. We ignore, that our judgement or statement about sexual identity can only be synthetic posteriori, it would mean that the predicate adds information to the subject for example; ‘Humans are either male or female’. As it is empirical, it would mean there is scope for inclusion of additional data to expand knowledge about the subject. This reality cannot be changed either by the cultural norms or law. But, we consider (or act as if) our judgements on sexuality were analytical, a judgement where predicate is conclusively included in the subject, this creates a tussle with the reality of diversity, and lays ground for marginal groups to live in isolation. Management of our affinity to associate with mind altering substances has evolved different perspectives, the one most propagated is that ‘Drug use is a Crime’ or ‘Drug user is a criminal or diseased’. That has the drug user being given a chance to change (with or without coercion), and can be taken to task for noncompliance, inclusive of punitive action. Reflecting on our assumptions about the drug user or drug use can throw light on our skewed perceptions. For example: ‘All drug users are addicts’ or ‘Drug use causes addiction’ or ‘Once a drug user always a drug user’ or ‘recovering addict’. All such statements carry with it assumptions of universality and the presence of a causal relation with empirical evidence. All these statements assume drug use always, in every single instance, causes addiction and there are no drug users who are not addicted or become a non-user (without being part of self-help groups). To explore our restrictive view point, we can examine the statements; ‘All drug addicts are drug users’ or ‘All drug users are addicts’; the first statement is an analytical statement or judgement, for the concept of drug user (predicate) is contained, in some manner, within the concept of drug addict, the subject. But, in case of the second statement it is a synthetic statement and so the predicate can only expand on information about the drug user, the subject. Besides, our synthetic judgement/statement, as in the second example, does not just add information about the subject, it but creates scope for marginalization for the concept of addict has a negative connotation within society. Thus, when we state - he/she is an addict; instead of accepting it as additional information on the subject, it leads to process of labelling and marginalization. The response by others to this information is to depersonalize the individual and emphasize upon the common myths regarding the drug addict within the given socio-cultural context and brush aside all else. This depersonalization ensures a strengthening of marginalization, for the concept of drug addict has a negative connotation that affects all spheres of the individual’s existence (education, health, social skills, social relationships and work) and the individual no longer struggles only with his/her drug use but also with the weight of negative identity. This process is almost self-perpetuating with the drug user accepting the identity provided by others rather than asserting the need for questioning the assumption of universality and that selective perception regarding drug use, drug user and being a non-drug user. Depersonalization is highlighted or, in some instances complete, when the individual is diagnosed with or suffers from mental health concerns. This can be found in our statements regarding mental health. Within the Indian cultural context, it is not uncommon to state that the ‘Woman is possessed’. The assumption being she is not herself, but under the complete control of some other force, as though she has become irrelevant or non-existent. Here the predicate no longer adds new information, but rather replaces the profile of the subject completely. The terms or phrases used to describe a person with mental health problems, such as - insane, being unhinged or mad; communicates that the individual is in a state of having lost one’s senses. It, also, does not communicate that it is contextual, or it could be temporary, of a short duration. A context specific reality faced by an individual, that need not be applicable to past or future acts by the individual; often, becomes the foundation to measure the individual - be it his/her past or future. As though, the disorientation in consciousness, or inability to appropriately use temporal and spatial coordinates, as an existential reality is an unpardonable violation going against our set human profile. That extreme reservation towards mental health can be seen in our interaction with individuals we perceive to have let us down and have called to question our accepted ‘normalcy’. Individuals who assert difference in sexual identities or those asserting the right to be a functional drug user being given the scope for being productive and financially independent. This is hard to come by for those who have been labelled as having serious mental health difficulties. We do hold close to heart the ‘norm’ for defining our human self, and at times, go to extremes to keep it static. This can be through forceful incarceration, alienation or an array of pathways to behavior modification that have one fall in line. This is not to discount the relevance or need for pathways of care and drive towards humane intervention that are client centered within the given medico-legal and cultural framework. But, rather to explore whether or not we are too specific about intervention and do tend to ignore the role of the mind. It is a crime to use drugs in many countries across the globe, a few countries consider it the right of the individual to choose and evolve his/her sexual identity. While mental illness, even in its extreme instances, is not a crime; it can lead to being incarcerated for care. Suicide can still be a punishable offence in many a place, it is only recently that India made changes to remove suicide from being a punishable offence. It is not surprising that the Law is limited in what it offers, for it can only set boundaries based on socio-cultural, political local reality and international provisions on the issue at hand. An Act does not evolve without any link to local socio-cultural norms; the link exists, to either strengthen and adapt socio-cultural norms or reject the same, the latter seen in the case of abusive/harmful cultural practices. A legal frame put in place can create different levels of intervention/action that aims at modifying human behavior with varying degrees of protection or coercion against ‘abusive or criminal’ behavior. Measures undertake include: a) Asserting Human Rights of Individuals in case of sexual diversity, drug use an mental health problem; b) Using punitive/coercive methods to modify use, trade and sale a)of drugs. In certain countries, coercion or punitive measures is resorted to, to ensure that individuals fall in line and follow a set path on sexual identities; c) The Mental Health Act, even if in place, is rarely adequate to deal with the cultural stigma attached to individuals suffering from mental health concerns. While the status of individuals with mental health concerns, in Europe and United States find their legal rights being upheld; the situation is not very comforting in most other countries. A scarcity of resources ensure that adequate support rarely comes the way of individuals with mental health concerns. Our desire for a medical solution to address issues of sexual identities, drug use and mental health problems reign supreme and it is evident not just in intervention programs but also in the search for a genetic rationale to understand diversity in sexuality, desire for mind altering substances and the presence of mental health problems. The genetic link is sought not only for intervention and care but also for the possibility of making choices that ensure a static human profile in future generations. An inhumane desire that can strengthen the rationale for discrimination in our minds. The use of chemicals substances is central or significant, for individuals who have problems with mental health or addiction. Substances are used to provide symptomatic care be it for dealing with physical and psychological discomfort the individual experiences or for addressing issues related to withdrawals in case of drug use or in dealing with mental disorders ranging from depression/ anxiety to schizophrenia or psychosis. In extreme cases of mental health concerns, the focus is to numb the mind and hope that slowly the individual can be brought back to everyday reality and provided further psychotherapeutic intervention for positive change. The canvas of mental health concerns is vast affecting diverse profiles of individuals. Within the context of this article the focus is more on issues linked to schizophrenia and psychosis, for they can have an extreme negative impact on quality of life and make the scope for developing one’s full potential a distant dream, than ever a reality. Pharmacological treatment for mental disorders (schizophrenia or psychosis) is relevant, but it is not devoid of adverse impacts. It is these adverse effects, especially – sedation, a sense of dizziness, lethargy, lack of interest; and their impact on the individual’s mind, that is a cause for concern when the adverse impact continues for a long term. The WHO website (9) does indicate the limitations of available drugs for medical care of mental health concerns, especially those as (schizophrenia, psychosis) and their probable adverse effects. Life skills training or social support is not seen to have a significant impact in ensuring functional independence among individuals who have been treated for severe mental health disorders. Psychotherapeutic interventions can be broadly considered as psychoanalytical, the behavioral approach and humanistic therapeutic intervention. While psychoanalysis focuses on subjective reality, especially emotional aspects, unconscious motive and meanings assigned to problematic behavior; the behavior therapist focuses on learning or conditioning. An emphasis on thinking is central to cognitive therapy (10) within humanistic therapeutic intervention. The premise of cognitive therapy is that we have cognitive structures (schemas) that organize how we think, feel, act, relate, and understand, it shapes our interpretation of the world and our response. Change occurs by cognitive restructuring of maladaptive schemas, by focusing on negative automatic thoughts and replacing them with more adaptive ways of viewing life events. The process is to identify how the current problem is being maintained and work towards resolving negative thoughts, feelings, behavior and functioning. The thought process and source of knowledge is not the focus, but behavior change is. While the medical model, through psychotherapeutic intervention does focus on thoughts, the emphasis is on changing behavior, feelings associated with events or behavioral concerns and limited to changing thinking patterns or strengthening or adapting select schemas of the individual. There is no specific focus on knowledge or self-knowledge creation, and whether there is a sense of continuity, for Self, through conflict situations and beyond; for it is possible these have a significant role to play in being in the margins and the process of marginalization. Central to living in the margins, is the inability to ‘be there’, whether it is the conflict of ‘being me’ (as in case of sexual identity or in some instances drug use by individuals) or difficulty in sensing or perceiving time or spatiality as sensed by others, when facing mental health concerns. The deviation in sensing of temporal and spatial aspects of reality is seen in the case of hallucinations, fears, compulsive behavior and addiction of various kinds. Heidegger points that the undifferentiated character of Dasein, in its everydayness, is a character of averageness. When the character of averageness of Dasein is shared by self and others, there is no conflict. But, often the relation is not smooth, especially in the case of marginal groups and society, at largeThere are different aspects of everydayness in Dasein, which Heidegger (ibid, 97-112p) focuses on; that can be used to illustrate its relevance and explore the process of being in the margins of society. How, despite sharing the same world-space, individuals can have different perceptions, understanding about an entity, both as an entity itself and in a relational manner. When Dasein comes across entities or equipment in its everydayness, for example when reaching for a glass of water, we rarely acknowledge it as a glass within the space of a room. It is the same when reaching for a remote to put on a TV show. When we enter a room we may be aware of the entities or equipment’s presence- at-hand (drinking glass, water cooler, or TV); but, its usability is clear to us only when we manipulate its specific characters (characteristics/ features) for any service- be it to quench thirst or to entertain. While we may have theoretical knowledge about a water filter or Television; it is only through use that we gain specific knowledge related to using the equipment or entity. On similar lines, if we consider the entity, a drug; the theoretical and serviceability knowledge available to the drug user and non-using family members is different. This is not say that knowing-through-use, is always relevant or better, it is to indicate there is a difference, which in turn affects the whole sequence of events that occur in our reality of ‘Being-there’. To explore it further, Heidegger spoke of understanding the characteristic of an equipment in all its totality becoming possible only when there was a disturbance of the relations in its use. It is then that the equipment stands out from within ‘Being-in-the-world’ as illustrated in the case of a broken hammer, a dysfunctional hammer makes the equipment stand out clear in the mind of the individual. This can be seen in the case of drug use; the user is confronted with the reality of his/her drug use when the drug makes its presence-at-hand clear by being unusable (as when adulterated) or through difficulty in accessing it. The user is not just aware about the characteristics of the drug but also many other relational realities that evolved through the use of drugs in his/her world of drugs. The intricate relations that evolved with drug use, may make a drug user to turn his/her entire focus to change the reality of the drug from being inaccessible to ‘Being-present-at-hand’ and ‘Being-ready-to-hand’. At the same time, the immediate environment, the family, would have a different take on this situation.The narration of that, by a drug user, could illustrate the point - he recounted how his family placed him under house arrest to ensure he could not access or use his drug of choice, Heroin. As days passed the drug user found that beyond the physical discomfort his only thought was the desire to have the drug, that gained in intensity. In time, his family gained confidence that he could be without the drug, for he had become functional, as expected. After, over a month of being physically drug free, his family, ended his house arrest. The instant he was out on his own, he went to the drug joint, for a smoke. Here, the drug being present at hand or drug-absent-at hand means two different realities for both the drug user and his family. While the drug as an entity or equipment available for its serviceability of enjoying a ‘high’ gained intensity in the mind of the user; for the non-drug using family members, the drug-absent-at-hand diminished the significance of the drug in the life of the drug user. Thus, different states of Being-in-the-world, or Being-present-at-hand, or Being-I, or Being-with-others, or Being-with-another; exist for the same entity (the drug) among beings who share the same world-space. The state of Being in the world or ‘Being-ready-to-hand’ and ‘readiness -to-hand’ can mean different things to different people not just in terms of entity or equipment present at hand, but also in terms of a reference or sign. Heidegger, focused on how a sign could occur as an entity that is ready to hand. As in the case of a sign on a signboard. He also focused on the presence of a sign within an equipment that denoted serviceability to one person could be an indicator of a relational reality, to another. To elaborate on the latter, he spoke of a car’s indicator which the driver could use, which other motorists could use to gauge the direction to follow, to ensure a smooth flow of traffic. On similar lines, there does exist the reality of the drug or its paraphernalia being a reference, or offering its serviceability or being a sign. But, here there would a difference in the state of Being of the drug user and immediate family members. For the drug user the drug paraphernalia as the heroin pipe, Being-present-at-hand, would indicate the possibility of serviceability or use of the drug. Whereas, to the immediate family members, the drug paraphernalia being present-at-hand, would be a sign- probably a warning sign of its adverse impact on the drug user’s -world for education, work, social relations etc. Unlike the drug user they would not, even for a moment, consider the heroin pipe as an entity for serviceability, that could be sought after. Temporal, Being ‘in time’ functions as a criterion for distinguishing the realms of Being, ‘… Dasein tacitly understands and interprets something like ‘Being’, it does so with time as its standpoint.’ (Heidegger, 39p.). But, what do we mean by Time (11) , there is a physical time or what the chimes of the clock tell us; biological time based on the organism’s internal clock or cyclic processes such as heartbeats, breathing, the sleep-wake cycle; and psychological time, best understood as awareness of physical time or considered phenomenological time. Psychological time, unlike physical time, is subjective and varies based upon the subject experiencing or sensing ‘time’. While an enjoyable experience can make time ‘fly', fear or negative emotion can ‘burden’ one with time, that can wear one down. But, is our experience of time limited to individual reality. According to Heidegger, we understand entities present-at-hand in a definite mode of time, the present. But, then the present and its temporal reality is not detached from past, which is always present in some form as ‘present-to-hand’. The past experiences could refer not just to individual experiences, but also that of a community. This could refer to the cultural frame of reference for the community, or Myths. This shared belief system can affect the present at hand, for it could accentuate fear; for example, fear of a specific location that is haunted. We would avoid the location, even if the act adversely affects our lives; fear could make us change our place of residence. Shared belief systems can influence the choice of life partners, or choice of livelihood depending on how we relate to the present-at-hand or Being-with-others or Being-with-another. For those who live in the margins, two emotions that can be regular visitors, in their lives, are anxiety and fear. Both these emotions affect the state of Being, as they influence the temporality and spatiality associated with Being-there. Anxiety and Fear have been explored by Heidegger in relation to Being-there, especially in the case of our everydayness. In our everydayness, understanding plays a crucial role, for it is through the ‘State of Understanding’ that one’s ‘potentiality for being’ is disclosed in such a way that ‘…Dasein always knows understandingly what it is capable of. It ‘knows’ this, however, not by having discovered some fact, but by maintaining itself in an existentiell possibility’.’ ‘Understanding makes it possible for Dasein to look around and grasp or know what it is capable of ‘(Heidegger, 385p.). But, this can be disturbed when in a state of Anxiety or Fear. Anxiety, can play a constructive role in our everyday reality, when it is resolute and thereby beyond the reach of fear and can use the present-at-hand and ready-to-hand both authentically and inauthentically towards a functional existence (ibid 393p.,394p.). But, this often is not the case for individuals who struggle, when living in the margins of society. When in the state of anxiety, there can be a sense of indifference; as though present-at-hand or ready-at-hand has no meaning, any longer. In the case of fear, there is a sense of something imminent or threatening, in future; that makes one forgetful and may lead to being lost in the emotion of fear or turn one evasive, seeking any diversion. Both fear and anxiety temporalize itself to the state of mind, as in ‘having been’ for it is the past that leads to a state-of-fear or anxiety. While everyone goes through such experiences, the impact on individuals who live in the margins can be stark as such instances can be frequent and thereby affect the sense of unity that gives a sense of continuity as streams of experiences that go on to create the ‘I’. To illustrate the same, fear of enclosed places can hamper our everyday experience; it can affect choice of place of work or occupation, our choice of entertainment, relaxation. The intervention opted for would be to use common sense or professional guidance for behavior modification, but rarely as focusing on the stream of thought. • In case of extreme sense of loss to comprehend the unknown, threatening experience, professional help will be sought. The immediate step would be to give drugs that can numb the senses or modify the same, and the individual is set in a state-of- disconnect and numbness. The goal is to shut off the discomforting experience and slowly the drug is tapered off; the success of the intervention is the absence of such experiences’. • Often, psychotherapeutic intervention focuses on the impact of the experience on the individual’s life with a limited desire to explore the hallucinating experience itself, and even when focused on; the idea is to grasp the link to individual’s personality, life experience and subjective perception about self and others. • In rare instances, the individual learns to accept the ‘hallucinating experience’ as a distorted representation of reality that occurs for an instant or plays out as an event. After all, if fear and anxiety are taken away from a hallucinating experience, then it is possible to perceive the same, as one would watch strange events in a movie. A distancing from the discomforting perception can make the experience less threatening and thereby reduce the scope for disconnect between individual state-of-being-there; having been, and to be in future. A journey of mind made possible only by the individual, for which no drug can be a substitute, but, psychotherapy can facilitate or equip the individual for the journey. It is logically possible to deal with it, after all the greatest discomfort is that experience is not shared by others and the absence of explanation, for the distortion perceived. It is the absence of a logical explanation that causes the discomfort, along with scope of being labelled insane. This would explain to an extent why service users do state having information on mental health issues can facilitate their ability to deal with mental problems. For some years, professionals from the field have been emphasizing on the need for the Service Users Perspective (Rose Diana and Phil Thomas, 2001; Michel Syrett) (12). Even in the absence of information, it is possible that an acceptance and skill to distance Self can change the emotional burden of hallucination. A few experiences have indicated the same; while working at a de-addiction center, an inpatient had extremely difficult hallucinating experience, the medication did not seem adequate, and for logistical reasons, the consultant psychiatrist was not available. The duty doctor and nurses were unable to pacify the patient who was turning violent fearful of the hallucinating experience. The medication provided was not having the expected effect as relaxing or sedating the patient. The situation was chaotic, while the patient was asserting there was a weird, violent, animal present in the ward the nurses were pacifying the patient asserting there was no such animal. The conversation was going on in tandem with no consensus in sight. After observing for some time, I went up to the patient and said he was right, there was indeed a violent, aggressive, animal. The patient became still for a moment and stared at me, unsure, but was not uncomfortable about sharing the image with another individual. Catching on to that moment where his attention shifted from the frightening image to my comment, I elaborated that, though I could see the animal it was very vague and whether he could describe the image to me. For some reason, he listened to my persistent request and began to describe the animal, as he gave more details his fear was replaced by desire to observe and communicate or rather share it with another individual who could at least partially observe what he perceived, which till then he believed was visible only to him. As time passed the drug began to have an effect, and he relaxed and went to sleep. The next day, he did not have any recollection of the experience; and there was no sense of something incomplete or missing. Yes, ‘something-missing’ is what happens to individuals who spend years depending on drugs, as the main option for dealing with mental health problems. A single incident of hallucination, is different from confronting it as a daily or frequent reality, that too, from an early age. When help is sought to deal with subjective reality, the option open is medication with or without institutional care, along with psychotherapeutic intervention; quality of care varies across countries and within countries. The focus of the Service User Perspective is strengthen a participatory approach, with service user’s view being integrated in the care provided. The documentaries made by Service Users focus on the limitation of non-institutional and institutional services (13). Accessibility to services, quality care, long waiting period, and irregularity are focused upon and its relevance highlighted; another aspect that comes through is the lack of awareness on mental health symptoms and their being caught off guard. Is it possible that self-knowledge can facilitate individuals living in the margins to evolve strategies that can facilitate dealing with marginalization and pathways towards change? There is limited literature that focuses on the thought process or on self-knowledge creations that deal with issues of stigmatization, marginalization and Being in the margins. At the same time isn’t the thought process the basis for dealing with differential experiences, at the level of consciousness, perception, sensation and the integration of experience. Wouldn’t skills in understanding the thought process facilitate the creation of self-knowledge that can equip the individual to deal with being in the margins resulting from a choice of sexual identity, drug use or vulnerability to mental health concerns. Physiological differences are seen between brains of those with mental health problems and those without any mental health concerns. There is a point of view that difference in brain structure that indicates vulnerability to mental disorders is evident in prenatal stage (ibid), when the infant’s brain develops. Another study, with a small sample, indicated that individuals who have suffered from depression for years have less white matter, as against those who do not have a history of depression (14). It is the structural vulnerability of the brain and environmental reality that has been seen to result in making individuals vulnerable to depression, schizophrenia and other mental problems. The focus of present scientific research is on identifying ways of reducing structural vulnerability or to equip the person to get beyond the same through chemical and technological intervention. But, whatever the case may be, isn’t ‘thinking’ really beyond drugs or technology, for both can at the maximum numb the senses or create a false sense of positive feeling. These do not change thinking process or equip the individual with skills to deal with negative or frightening experiences. Is it not possible that the structural changes seen in the case of schizophrenia or depression may be from intense, almost continuous fear and anxiety? Which is accentuated by genetic vulnerability. Under such circumstances, wouldn’t it be relevant to explore ways in which self-knowledge can be developed to deal with intense fear and anxiety? Self-knowledge or knowledge concerned with self, faces limited criticism about its relevance but its rationality has been questioned by many (15). Whether rational or not, it is the base that gives a sense of “I” during our life-time, though the emphasis on “I” often falls under the shadow of cultural norms or frame. The individual’s assertion of identification with marginal group/s, whether affirmative, reluctant or hidden, is a statement on his/her individuality. Such an assertion of attributes of Self or even of “I” evolves by accessing information from different sources using different methods. Social scientists have focused on the same, but prior to dwelling on it; the views of Kant on knowledge creation is relevant, especially within the context of marginalization, for fear and anxiety can create chaos regarding temporal and spatial reality, as experienced by the individual. Knowledge is made possible through intuitions that are dependent on sensibility, and understanding that emerge through concepts. According to Kant (ibid, 78p.) there are two types of knowledge: empirical knowledge and transcendental knowledge. Empirical knowledge discovers concepts in a haphazard manner, there is no systematic unity, the concepts are coupled together according to their quantity of their content - from simpler to more complex. At the same time in transcendental knowledge concepts are united by principles and there is an understanding about absolute unity. Unlike empirical knowledge the order and completeness of the system of transcendental knowledge is determined beforehand and not left to chance. Here, the focus is on empirical knowledge, and as chance has a role to play the subject who perceives the sensation or appearance is relevant. Self-Knowledge, which is considered for exploration here, does influence chance; for empirical knowledge is objective but the decision to be objective is a subjective one. Other philosophers have focused on the conceptual structure of the mind or identified categories necessary for cognition of objects. For example, taking the entity “Quantity” used in Aristotelian categorical system, and applying the general concepts has judgements turn universal, particular or singular. Kant did not give much significance to self-knowledge or subjective deduction. But, wouldn’t the state or quality of subjective deduction influence our objective deduction; for the state of self can influence unity of consciousness (16) , inner sense (17), and consciousness of self (18). Wouldn’t Dasein or “Being-there” influence I, the subject and his/her capacity for objective (empirical) deduction. It would be probably relevant to explore the possibility of building self-knowledge that can facilitate ways to deal with debilitating fear and anxiety, whether linked to hallucination or not. When experiencing fear, we tend to transfer the experience of fear in one instance to other instances, for example, an individual having a traumatic experience in an enclosed space transfers the negative emotions to all enclosed places. Fear somehow takes away our capacity to be discerning in our judgement, use concepts (universal, particular, singular), a capacity for that would be of great therapeutic value, if the mind could be trained or evolved to do so. It is not just fear, even our tendency to give selective qualitative value to the drug of choice, by decontextualization of its use and considering our mind an irrelevant reality, viewing the self as a puppet in hands of the drug is rarely focused upon; for when we consider drug as all powerful, there is a conceptual process that we accept. We tend use concepts churned out by others and live by the same. “Once an addict always an addict”. With hallucinations, an individual would experience the same difficulty. Recent changes in cognitive therapeutic intervention has led to Hallucination integrated therapeutic intervention. The focus is largely on auditory hallucination and deals with the content to facilitate the individual to get beyond the crippling effect of negative inputs through hallucination (19) . While auditory hallucination offers scope for psychotherapeutic intervention because of the emotional content, this is not the case with visual hallucination - light flashes, or feeling a pattern or structure as all powerful and threatening. Psychotherapeutic intervention does offer a way towards individual to deal with their mental health concerns, but, is it not possible for the individual to evolve self-knowledge to deal with setbacks or difficulties faced through intense fear, hallucinating experience or both. Hallucination is considered an anathema by the subject and others (who are not going through the experience), but, at the same time visions are sought out by individuals (e.g. artists), and indirectly and directly supported by others. The difference between the two is that while visions have relevance within individual’s world view or worldhood; hallucination tends to destabilize the capacity of the subject to “Be there”; and hampers individual capacity for objective deduction. Another difference is that while hallucinations are considered aberrations generated by individual’s mind, visions are considered guidance from other sources than the individual’s mind or guidance from the sub-consciousness. Is it possible that hallucinations are expressions of the evolving human mind, for when we assert structural vulnerability (or in combination with other life events) generate images, we are also asserting that the mind can generate objects/stimuli (visual, auditory and others), which can be perceived by the individual in the worldhood of things? For aren’t the images like holograms, which we do consider as object. In that case, is it possible to consider, hallucinations as expressions of the human mind; and look at these as symptoms of mental health in a different way. This would certainly take away the stigma, to some extent at least, attached to individuals having these experiences. Isn’t such a view point very much in line with the computer computations that indicate human beings as capable of perceiving beyond the three-dimensional (mathematical dimensionality) reality (20)? At the least, it does indicate we are yet to understand the capabilities (full potentiality) of our brain. Studies have indicated that perceived forms in hallucinating experience is a sort of mixed reproduction of different experiences . Aren’t these indicating that mind can travel beyond the presently understood empirical reality? Here, this paper has a very limited goal, that is to see whether there is scope for an individual experiencing hallucination or intense fear and anxiety that hamper the sense of “me” during a different life experience; to evolve methods to study their experiences and create a body of knowledge that can facilitate their journey for change. Attempts to seek self-knowledge and develop the same through different methods is carried out by all of us, though the degree of emphasis on rationality may vary. This process that exists as part of us, and continues through our life, gives a definition of “I” for self and others. Knowledge creation is crucial to self-knowledge, it is the everydayness in relation to our Dasein, that makes knowledge creation possible. As Kant pointed out the process of knowledge creation, to make experience possible requires three kinds of synthesis to take place; a) mind must generate temporal spatial structures, b) it must associate spatio-temporally structured objects with other spatio-temporally structured items (ie. Synthesis of reproduction in imagination) and c) it must recognize items using concepts and the categories in particular (synthesis of recognition in a concept). Knowledge is made possible through synthesis, ‘...act of putting different representation together, and of grasping what is manifold in them, in one knowledge’(22) . But, all this comes to naught when spatio-temporal reality is disturbed, as when in a state of hallucination, or to an extent with fear or anxiety. Given this constrain, the question is, whether it possible to go beyond it and develop skills needed to facilitate the individual experiencing disconnect, anxiety or fear for long durations, to develop self-knowledge that helps in dealing with state of mind and get beyond it. We evolve self-knowledge in different ways, it could be through consulting the physical world for verification, social comparison with others, reflected appraisal (how we are regarded by another person, this perception determines how we feel about ourselves), introspection, causal attribution to behavior and inference (23) . Within the context of marginalization, it would be useful, to look at reflected appraisal and self-verification, as an active way to deal with stigmatization. Towards this, the model for reflected appraisal and self-verification (ibid), has been adapted here and presented below, to illustrate the process; present dynamics of mental health management has been used for illustration. As per the Fig. above, ‘My view of My Mental Health’ is shaped more by others, than by self. The scope for a two-way process (g) exists between, my view of my mental health and the labeling; but that would be more towards the integration of labels and vulnerabilities attached within the self, and rarely for change. through labelling that is transferred directly (f), or through reflected appraisal (d) and (e), and institutionalization (c). The transference of ‘Your world view on my mental health’ through labelling is interactive, whereby the existing deviation from labelling is transferred back to ‘Your view on my mental health'; with new information being gathered through institutionalization or the community at large. 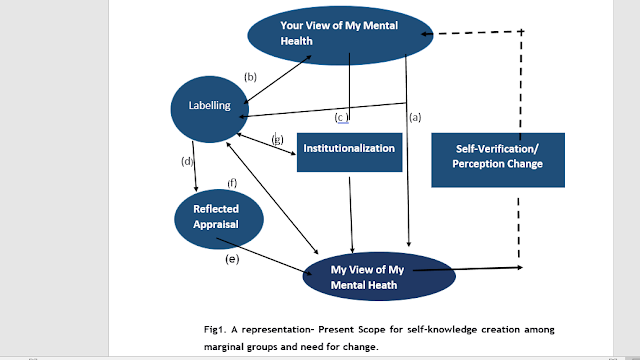 At the same time, the option for the individual to use the self-verification process to adapt his/her own self-appraisal is limited, and the individual also has no set pathways to change the impact of “Your view on mental health" that affects the individual directly and indirectly. Besides, when in state of fear or anxiety or under the experience of hallucination the basic process that leads to knowledge creation is disturbed, for in fear, the mind is lost and unable to discern or undertake a synthesis leading to knowledge creation, including self-knowledge. Under such a situation, self-knowledge is formed far more by the perception of others, rather than from any active attempt by the individual to shape it. Defining self, is a right, and means creating space in Society that is not very forthcoming in accepting diversity. There is a need to understand the importance of self-knowledge and ways to facilitate development of self-knowledge, even if it is not amenable to conscious molding. Self-knowledge influences many psychological processes, Epstein (1972) (24) focused on how self-views affect our view of the world. Along the same lines, according to Markus (1977) (25) self-views held on to with great certainty function as Schemas, they are hypothetical knowledge structures that guide the processing of information. Schemas that individuals hold on to can be varied; being dependent/independent, honest, kind, friendly, reserved etc. Individuals with strong schemas for independence process information regarding independence faster than others. Other studies found that individuals with strong schema accept information that confirm their views and refute or reject information that don’t. Individuals with strong schemas are consistent in behavior about specific trait. Schemas also influence individual’s social perception, understanding of others, act as a reference point for evaluating others, and influence our judgement about others and their work performance . Given the present state of interventions for individuals with mental health problems, drug use concerns and gender identity deviations; there is a need to look at certain issues and the scope for developing schemas as part of dealing with marginalization. • When interventions focus on group identification and strengthening of the same, is there scope for developing varied self-knowledge and guiding of the same. • When ex-drug users and recovering users are told they are powerless and need to always believe in the sense of powerlessness about their drug of choice and situations that can put them at risk to slipping back to drug use; can such an individual ever get beyond their marginal position and evolve to their full potential as individuals? • Individuals with mental health problems, are often caught unaware; especially in the case of those vulnerable to schizophrenia/ psychosis, and after the first incident there is rarely an effort to orient the individual on the symptoms experienced. The only option for the individual is to fit into the self-view or image vulnerability provided to him/her, this may be also a defense mechanism for fear of traumatic experience of hallucination/delusions lingers within the individual. • When institutionalized for care, there is a total disconnect with social contextual reality, unless there is a link connecting the person institutionalized with members from their immediate social network. How does the person create a link between the institution and outside society to make the transition less traumatic? Would sharing a sense of ‘everydayness’ by the family/ a member for social network (e.g. a video documentation or personal sharing of their realities), a two ways process of communication, about life outside and within institution, create some sort common ground for shared experiences. • This can also create a sense of continuity for the individual under care for drug use or mental health. Of course, the specificity would vary across individuals, but, even the thought of a sense of continuity for the Me/I across -pre, present and post traumatic experience would change the way the affected individual and others look at intervention and care. • Study on gender and schema (Markus Hazel, Crane Mare, Stan Breinstein and Siladi Michael, 1982 ) (27) indicated that behavior and self-views, of high androgynous individuals and those with masculine schema, may differ even when both may have some sort of masculine schema. To elaborate, “both, masculine schematic individuals and high androgynous may think of themselves as assertive and attach very similar meaning and examples to the attribute, but the high androgynous is also likely to have attributes ‘understanding’ and ‘compassionate’ as the defining feature of the self-concept”. Along this line, in working towards self-verification and in the interactive process of bringing change in the lives of marginal groups, is it possible to identify additional attributes, within marginal groups and others, that create scope for reducing instances of marginalization and identify schemas that strengthen walls of separation? • Besides, hallucinations have been inquired into to provide a phenomenology of the subjective character of perceptions and perceptual hallucination (Dorsch Fabian ) (28), the focus is to positively characterize hallucinations, in terms of their phenomenological connections to perceptions. Against this background the possibility for change in perception regarding marginal groups, would require interventions to consider the process of self-verification for social change within the community, and the scope for facilitating individuals to identify their schemas and ways to develop self-knowledge. Probably this process would create a change in the present static situation of emphasis on walls of separation, as the only way forward. This article is dedicated to my parents, P.A. Charles and Daisy Charles, who taught me to value and hold on to freedom of thought, and embrace diversity in human beings and nature. 2. Heidegger Martin. 1962. Being and Time. Harper and Row: New York. 3. Kant Immanuel, 1991. Critique of Pure Reason, Everyman’s Library: Great Britain. Molly and Gabriel Britto. 2002. Dimension of Drug Trafficking, UNESCO MOST and UNODCCP. Michel Syrett Service User involvement in Mental Health Research; A user’s Perspective. Schizophrenia. Mcgill Journal of Medicine. Published on line 2011 Jun. Personality and Social Psychology, 35, 63-78. Gender. Journal of Personality and Social Psychology, Volume 42 (1), 38-50p.